You might remember a graceful quilled alphabet that sailed around the internet not long ago. It was made by Sabeena Karnik of Mumbai, who recently posted this beauty on her Behance page. Sabeena, a graphic artist, illustrator, and calligrapher, does mighty fierce paper cuttings as well, so don't miss those. Hey, it's still January... let the New Year celebrations continue! Remember, the giveaway for three copies of the new book Quilled Birds, Bugs & Butterflies ends this Sunday, January 22. Have a great weekend! I'm already looking forward to seeing you again on Monday. 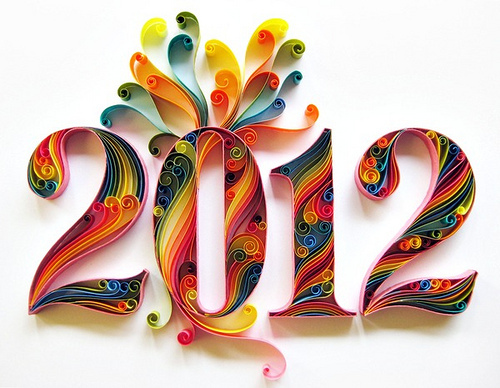 We should all have a 2012 reminder like this. It's both fun and inspirational. gorgeous artwork! thanks for sharing the links. i've always been fascinated with the versatility of paper. Wow, that's great! totally fall in love with your quilling!!! I wish you a very nice weekend here! I am totally inspired by these beautiful creations. You have definitely inspired a whole lot of us to take up quilling! Oh, how I love that 2012 piece! Love it. This is so beautiful with all the bright colors. I checked out all the additional sites you listed...what a great way to spend my morning...I was so captivated, I forgot to get my tea! LOL! TFS...I check out your blog first thing!!! How absolutely beautiful - such gorgeous colours too. Hope you have a good week. I checked out the alphabet - love it, but how to you make the outline?